OK, who whistled at me? 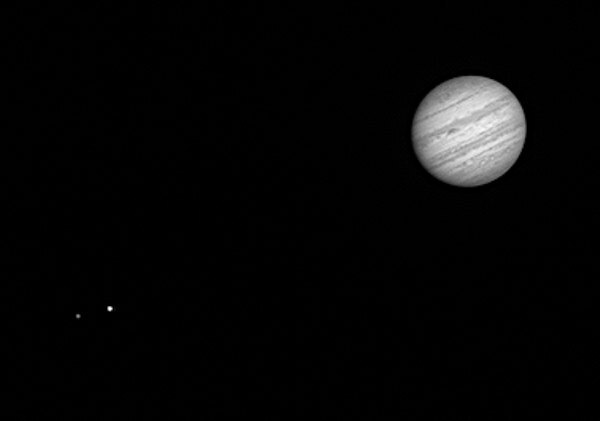 How sharp were film astrophotos? This web site is protected by copyright law. Reusing pictures or text requires permission from the author. The ads that you see here are not controlled or endorsed by Covington Innovations. They come from Google based on your browsing history. If offensive ads appear, click on "AdChoices" and then "Ads Settings" and make changes, and/or turn off cookies in your browser. Click here to see books and other items (mostly astronomy-related) that I am selling through Amazon. More will be added in coming days. CLICK TO ENLARGE. Copyright 1980, 2015 Michael A. Covington. This has long been one of my favorites of my film photographs, simply because of its high technical quality. 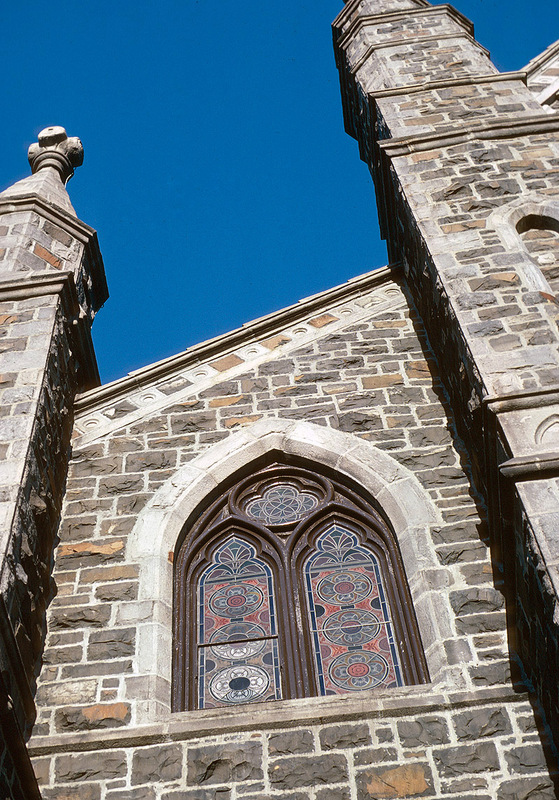 Kodachrome 64, Olympus OM-1, Olympus Zuiko 24-mm lens. Digitized with a Nikon CoolScan III. Even the larger version that you see when you click on the picture does not have as much resolution as the original slide. The entire world is "bugged"
About 50 years ago, a new technology surfaced: "bugs," hidden microphones with transmitters for eavesdropping on people's conversations. They had been thought of in the 1940s but were hard to build until transistors became available. Today almost everyone carries a potential "bug" on their person — the smartphone. As you already know, you can secretly record conversations in the room around you by just turning on your audio recorder. More alarmingly, software can be installed on smartphones to make them do this and send off the recordings to someone who wants to receive them. The same thing can be done with PCs that have microphones; I first heard of it being done with Sun workstations 20 years ago. I want to emphasize that this software has to be installed on the victim's phone. It can't be put in by remote control. So there are two ways to install it: voluntarily, or by being tricked into installing a virus or malware. One reason Apple has the App Store is to keep things like this from being hidden in widely distributed apps. Even so, I advise people not to collect "apps" or software of uncertain origin that is not really needed. And don't let a person you don't trust work on your smartphone or computer. There are other privacy risks with smartphones. Every cellular telephone transmits its location to the telephone company every few minutes. It has to, so it can remain connected to the right cell tower. This information is available to police and is very useful when someone dials 911 but doesn't give a location, and when a cell phone is stolen. Cell-phone calls can be intercepted. The old way, in the days of analog cell phones, was to simply listen to them with a radio receiver that tunes around 800 MHz. Newer cell phones are digital and not vulnerable to that, but there are devices that act as fake cell towers, accepting connections from nearby cell phones and (of course) relaying their connections immediately to a real cell tower, but meanwhile listening to the content. And we know, of course, that e-mail and the Web are not secure. E-mail is inherently a very public means of communication. Data packets are handed from computer to computer in a complicated way. As for the Web, whenever you view a web page, you are asking a server to send it to you on demand, and it has to know where to send it. You simply cannot view a web page without anybody potentially knowing you viewed it. Web connections that use HTTPS rather than HTTP encrypt their content. Other people can still find out that the connection exists, but they can't read what is being transmitted. That's how you normally communicate with your bank, for instance. With all of this in mind, what's a responsible person to do? Here's my advice. (1) When you need complete privacy, power off your cell phone or leave it outside the room. Yes, power it off, not put it on standby. I know you'll miss calls, but the voicemail system will still get them. Insist that others power off their cell phones too. (2) Don't let untrusted people install software on your smartphone or computer. (3) Don't collect untrusted software yourself. "Hey, this app will make your cursor look like Halley's Comet!" But it may also install spyware. Check out the reputation of any software before you install it. Even a quick check is probably enough. (4) Keep your OS up to date. Updating your operating system can disrupt spyware, if any is already there, and it certainly will fix vulnerabilities that have been discovered. Use antivirus software on Windows systems; the software provided by Microsoft is actually quite good, but you may also want to run Malwarebytes periodically. (5) Assess your risks. How much privacy do you actually need, and why? Remember that telephones and the Internet are for communicating, and "private communication" is almost a contradiction. Maybe you shouldn't be communicating your whole life to other people all the time in the first place. (6) Know how to catch a spy. If you think someone is spying on you, feed them false information that they will be sure to react to. I recall one case where a person's home was "bugged." With the cooperation of several actors, they made it sound like a mass murder was going on there, and the eavesdropper called the police — whereupon the police knew who the eavesdropper was. You can do less dramatic things that work the same way. National governments do this all the time. A good way to trace the "food chain" of spies is to give each spy a different version of a story, and see where else the various stories turn up. (7) Don't be paranoid. Don't succumb to the following pattern of irrational thinking: "They might be doing it, so they must be." Some people cannot disbelieve a suspicion once they've thought of it. (Getting stuck this way can be a sign of mental illness.) Remember to test your guesses to see if they hold up. Focusing and guiding are an exacting business in modern digital astrophotography. The reason — not adequately appreciated — is that digital sensors are a lot sharper than film, so the tolerances are much tighter. I got curious about this and decided to measure how sharp my film astrophotographs were, compared to modern digital work. This is the last Ektachrome astrophoto that I took with my trusty Olympus OM-1 camera and Olympus 100-mm f/2.8 lens. This is an 18-minute exposure at f/2.8; not impressive in other ways, since it was taken in town, but good and sharp. This was scanned with a Nikon Coolscan III at 2700 pixels per inch; that means each pixel corresponds to 9.4 μm (9.4 microns) on the film. Let's enlarge it so that the scanner pixels correspond to the pixels on your screen (or, on newer high-resolution screens, the distance units, which are about 100 to 120 to the inch). Not tack-sharp, is it? But remember that this is the equivalent to a 24×36-inch enlargement from a 35-mm slide. Giant enlargements like that are never tack-sharp. The most we expect is that 8×10's will be reasonably sharp, and 24×36's will look presentable from ten feet away. You're looking at the multiple star Sigma Orionis. 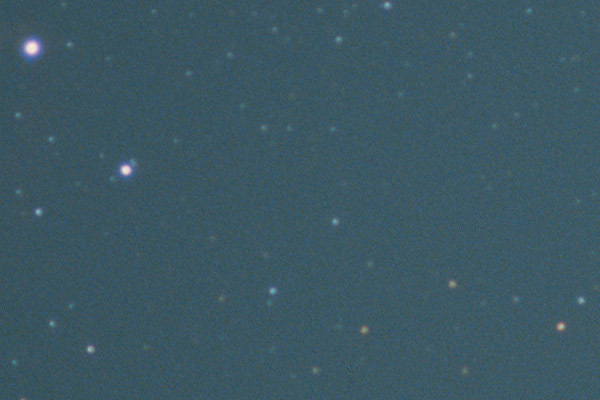 The smallest star images are a tad less than 3 pixels in diameter (full-width half-maximum). 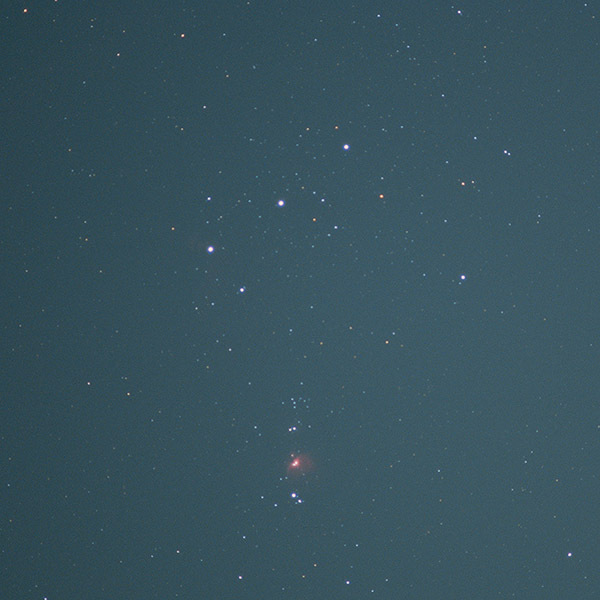 That means the star images are about 25 μm in diameter, corresponding to a diameter of about 6 pixels on a Canon 60Da. (That is 1/40 mm, a figure I used when writing about film astrophotography back in the old days, though I had not measured it in this way. I'm glad to see it confirmed.) My sharpest digital images have stars half that big. And that is why guiding, focusing, and lens quality are so critical with digital cameras. That is also why it is quite legitimate to shrink (downsample) an 18-megapixel digital image to reduce noise and discard tiny tracking errors. You can shrink it to about 2 megapixels and still have as much sharpness as was common in the film era! Addendum: Below is an enlargement of a small part of one of the sharpest film photographs I have ever taken, the picture of St. Mary's Church at the top of this page. Again, you are looking at scanner pixels (9.4 μm), and it's clear that the point spread function FWHM is at least 1.5 scanner pixels, or about 15 μm (equal to three modern DSLR pixels). So I think we can set that as a lower limit for film "pixel size." This was Kodachrome 64 (very sharp film) and a 24-mm Zuiko lens around f/8 (about as sharp as camera lenses got in the 1980s; they are only slightly better today). Note further that when a lens or film claims 100 lines/mm of resolving power (which is as high as 35-mm photography ever got), the Nyquist criterion might lead you to infer a 5-μm pixel size (200 to the millimeter). But film does not have pixels at regular intervals, so the Nyquist criterion does not apply. Film has a point spread function, and if the point spread function has a rounded top, it can be much wider than 5 μm or even 10 μm; the resolving power indicates any ability to distinguish two adjacent peaks, even if they are almost merged. That is why resolving power increases with higher contrast. In this book review (and, no doubt, in other places), Owen Gingerich explains clearly why Copernicus (and his followers) thought his sun-centered theory of the solar system was better than putting the earth in the center. It wasn't physical evidence. Until Galileo saw the phases of Venus, there was no observational evidence in favor of Copernicus. You can't tell whether the planets are orbiting the sun or the earth just by looking at them from the earth. It wasn't accuracy. Ptolemy's earth-centered theory predicted the positions of the planets just as well as Copernicus did. It wasn't even simplicity — even though that's what most well-educated people think. 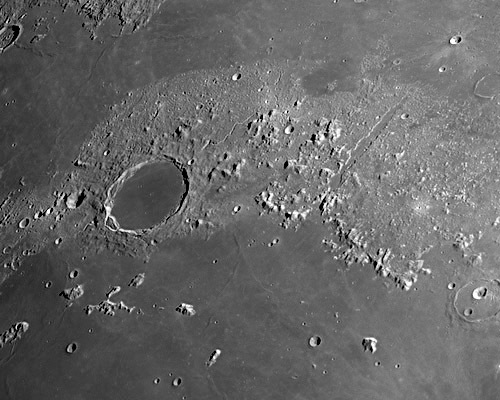 It's hard to tell who had a simpler system, Ptolemy or Copernicus. There wasn't much difference. What it was, according to Copernicus, was two things. (1) Copernicus explains why the planets show retrograde motion when they are opposite the sun. In Ptolemy's system, the retrograde motion could have been anywhere in the orbit; in Copernicus' system, it can only occur in one place, which is where it actually does. (2) Copernicus arranges the planets in order of orbital period; the planet nearest the sun is also the fastest, and so on outward. In Ptolemy's system, the order of the planets is not so clear. So point (1) provides a physical explanation for something that, for Ptolemy, was arbitrary. Point (2) is not physical but paves the way for physics; Copernicus can't explain the relation between orbital period and distance, but at least he notes that there is one. 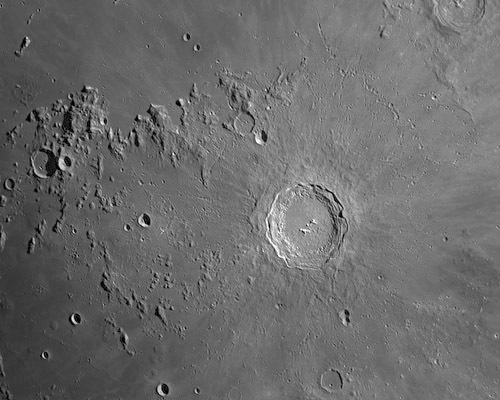 Because he had no hint of a theory of gravitation, Copernicus has been described as the last medieval astronomer. On these two points, though, he has his face turned toward modernity. I am guilty of perpetuating an error about the history of astronomy. Guilty, but perhaps not culpable, because all the major reference books said what I said, so I saw no need to check the primary sources. To avoid having to deal with the differing lengths of months and years, astronomers sometimes give the date as the number of days elapsed since a certain time in the remote past. This is called the Julian date and today's (at midnight UT on April 24) was 2457136.5. It ends in .5 because the Julian day starts at noon (to keep the date from changing in the middle of an astronomy session). Well, like everyone else, I said in one of my books that when Joseph Justus Scaliger (1540-1609) invented the Julian date, he named it after his father Julius C. Scaliger. That's what all the books say. Joseph Scaliger was doing deep research on ancient and medieval history. He invented the Julian date to make it easier to convert between several ancient and early medieval calendars. Now I've found out how Scaliger himself explained the Julian date. It is not named after his father. It is tied to the Julian calendar in a somewhat complicated way. Under Julian leap-year rules, the entire calendar (assigning weekdays to calendar dates) repeats every 28 years. The dates of the phases of the moon repeat every 19 years (the Metonic cycle). The Romans used a 15-year cycle for recordkeeping. Ancient and medieval date records are often tied to one of the three. The least common multiple of 15, 19, and 28 is 7,980. Scaliger called this 7,980-year period a "Julian period" and chose 4713 B.C. as his starting date because the three cycles were all at their beginning points on that date. It happens to be earlier than any recorded history, which is convenient but is not its only motivation. Read more about this in this article by Dennis D. McCarthy in Journal for the History of Astronomy, which, thanks to NASA, is free to read online. 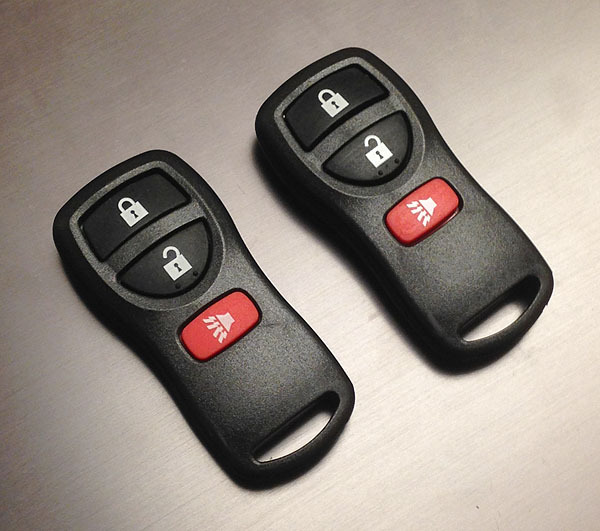 The other day I was wondering if we could add remote keyless entry to Sharon's 2008 Nissan Sentra. To my astonishment, the answer, confirmed on several web sites, is: It's already there, except for the transmitters! The locks are already electrically controlled. In fact, the car will go into the programming procedure described below; you just can't program it without a key fob (transmitter). So I bought a pair of the appropriate key fobs (Nissan KBRATSU15) on eBay for $8. They can be had at Pep Boys for about $50 each, but eBay was cheaper. Then I found and followed the programming procedure here to program the vehicle to recognize particular key fobs. I gratefully reproduce the procedure below, with minor editing. 1. Get in the car and close and lock all doors. 2. Insert and remove the key from the ignition 6 times within 10 seconds. (Remove it completely each time, and don't rush.) The hazard warning lamp will then flash. 3. Insert the key into the ignition and turn to ACC (accessory). At this time, the old ID codes are erased from the car's memory. You can get this far even if you don't have a transmitter, and it's a good idea if you think someone else may have programmed your car to work with his transmitter. 4. Press any button on the new transmitter once. The hazard warning lamp will flash. 5. If you have more transmitters to program, then unlock and re-lock all the doors electrically (using the switch on the power window control panel, driver's side door) and go to step 4. Do this for each transmitter, up to a maximum of 4. Unlock the driver's side door, open it, and close it. Transmitters will not work until this is done. To turn off the horn chirp, hold down "lock" and "unlock" simultaneously on the transmitter until the hazard lamps flash. To turn it back on, do the same thing again until the horn chirps. For more about how all this works, click here. Has the word "opinion" changed meaning? A recent op-ed in the New York Times (read it here — thanks for the link, Cathy!) pointed out that some schoolchildren are being taught a distinction between "fact" and "opinion" that seems misguided. It is certainly a way of thinking I have been encountering among adults, and I think it is indeed a mistake, or at least the word "opinion" has changed meaning (for them) so that it now refers to something much less useful than it used to. People are dividing "facts" sharply from "opinions" as if never the twain do meet. Facts are what the world forces you to believe; "opinions" are what you feel like believing. Falsch. Traditionally, an opinion has been a tentative belief about a question of fact. It is a belief held as probable rather than proven. Opinions are tested against facts. They are not just what you feel like believing. I am certainly encountering a lot of what I can only call irrationalism in political discussion. People choose the side they want to root for, and adopt "opinions" based on loyalty rather than facts. They are positively annoyed when any facts are brought up. Have you encountered this too? Late last night, one of my computers whistled this 5-note tune, almost like a bird call. I've been hearing the same whistle on campus several times a day at random times from other people's equipment. Neither my iPhone nor my Samsung tablet had any kind of visible message on its screen, so it took me a while to find out what the whistle was about. Apparently, it was the Samsung, wanting to notify me of an Android update. At least, the Samsung definitely had the whistle tune on it (which the iPhone didn't), and it was set to be the sound for "notifications," and when I opened up the (hidden) notification menu, there was a message about an Android update. So I updated it. However, I classify this as an egregious case of a computer being rude. It demanded my attention (with a loud noise) and then (at least at first sight) wouldn't say why. Imagine what might have happened if some college girl had thought this was my version of a wolf whistle in the library. Ouch! I'm afraid the Samsung whistle was part of what I call the "pip, beep, ding" subculture. Some people want their smartphones and tablets to make noise at random times so they can show the world they're important. "Yes, I'm talking to you for a moment, but listen to all those beeps and chimes telling you how popular I am with everybody else." To which I reply: Answer that thing or turn it off. [April 21:] Original text deleted. I strongly deplore gestures of hostility toward the United States, but it has become evident that there are many unanswered questions about the recent incident at Valdosta State University. Initial impressions of who did what, for what motives, were not accurate. Because I do not want to support, even indirectly, any misconceptions about what was obviously, to a considerable extent, a staged incident and a manipulated situation, I am withdrawing my original comments. [April 21, later:] The situation is growing stranger by the hour. Please understand that I have no inside information about it, and, at this point, little confidence in media reports. Everyone, please be patient and wait for facts to come out. I've had an insight into why Facebook makes you change your password after any incident, even incidents that couldn't compromise your password. For example, anyone who has accepted a friend request from an impersonator is told to change their password. Wait a minute — friends, even fake ones, don't have access to your password in the first place. So where's the risk? The answer is Facebook users don't have good passwords. Many Facebookers just haven't thought about password security. Plenty of them see nothing wrong with using their dog's name, or their spouse's name, or their high school cheer as a password. And those are the passwords that anybody can guess. So at the least sign of friction with another person — even an impostor who knows only a little about you — they tell you to change your password. Final thought: A good password looks like gibberish. If it means anything to anybody seeing it, it's too easy to guess! Update, 2018: There is a hoax going around that involves telling people that fake friend requests are going out in their name, when it's not really happening. Click here for updates on that. DO NOT PASS ON MESSAGES YOU ARE TOLD TO PASS ON. That is apparently how the hoax spreads. And do not spend time telling your friends not to accept fake friend requests. In any computer security situation, KEEP YOUR WITS ABOUT YOU and don't panic. Think clearly about what you have actually seen, versus what you have guessed or what other people's words have told you. This evening two of Melody's Facebook friends notified us of something suspicious. They had gotten friend requests from Melody even though they were already on her friends list. Sure enough, someone had set up a fake account using Melody's name and picture. Let me emphasize that Melody's real account was not broken into. This is not a sign of a virus or other security problem on Melody's computer. No; somebody had her name (which is public knowledge) and a copy of her picture (which is also public knowledge — you can save a copy of any picture you see in your web browser). They went on Facebook and used this name and this picture to open an account. It's perfectly possible for two people on Facebook to have the same name. (They may have a dozen John Smiths.) It's even possible for the same person to legitimately open a new account under the same name; people sometimes do that when they want to clear out an old account that they haven't been keeping up. So this is not a case of "hacking," just impersonation. Anyhow, the impostor sent friend requests to many of Melody's friends. How did they find out who her Facebook friends are? That may be public knowledge too — anyone can see your friends list — although I recommend changing that setting. Maybe they only identified one friend, using some other source of information, and when that person accepted, they were able to branch out from that person's friends list. So what was all this about? The impostor started a private-message conversation with one friend about "the Facebook Powerball grant," obviously a lottery scam. And about ten seconds later, the fake account went dead, because we had reported it. Kudos to Facebook for acting so quickly — about two minutes total turnaround time! How can you find out if this is being done to you? Search for your name in Facebook, and see if there are two of you. The impostors will almost always copy your face picture, which makes it easy to distinguish an impostor from a genuine person with the same name. How do you report it? While logged onto Facebook in the normal way (under your real account), search for your name and go to the fake person's profile. Make sure you've found the fake one; it will have little or no information on it and certainly won't have much, if anything, that you have posted. Then click on "..." and "Report." Follow the menus from there. You can also do that if you're not the victim, but it may take Facebook a little longer to investigate. For example, I could have used my own account to search for Melody, find two of them, go to the fake one, and report it. I want to make it double-clear that Melody's account, password, and computer were not "hacked" or touched at all. This was purely a case of someone somewhere else opening an account and uploading a copy of Melody's picture. And, like any other kind of impersonation, it is against the law. I was already taking steps to find the perpetrator — I didn't pursue it when it turned out to be a simple lottery scam with no intent to harm us specifically. If it had been someone trying to hurt us, we would follow the trail; Facebook's logs almost certainly give their location. In fact, I suspect, from the speed with which Facebook handled it, that the impostor was already known to them. 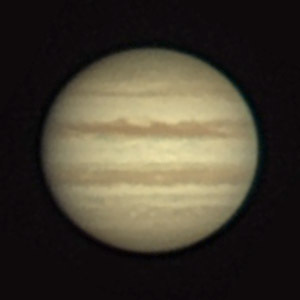 I had a bit of trouble with my Jupiter images from April 11. The ones I posted earlier were processed to minimize the problem, but here I want to show you the problem in its full glory. 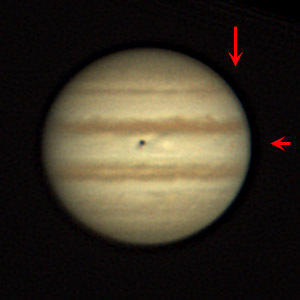 Both Io and its shadow have "twins" just below them. 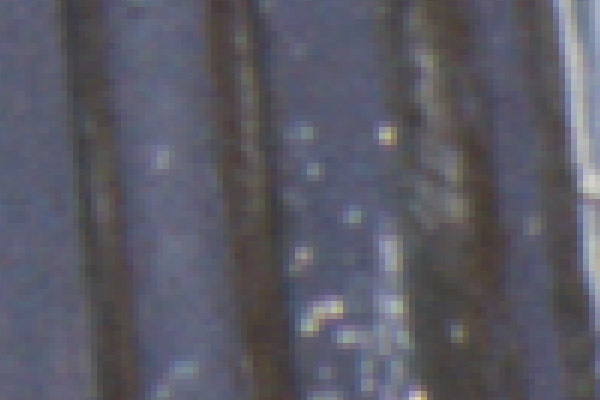 In fact, the whole image is smeared in that way, although most of the smearing is not visible because of low contrast. What gives? Well, I wasn't sure until I consulted an expert planet photographer, who confirmed that the same thing sometimes happens to him. Here's the explanation. The air wasn't steady when I took that picture. In fact, there was a pattern to its wobble — the planet image tended to shake and smear up and down. You can see this in the original, unprocessed video. 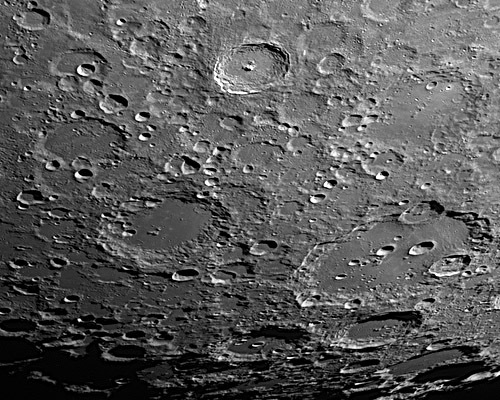 However, planetary image processing as we know it — the magic that turns a blur into a sharp picture — is based on the assumption that the blur varies randomly, so that a large number of random variations add up to a Gaussian blur. If there's a pattern to the blurring, it isn't Gaussian, and the Gaussian-based deblurring algorithms do not get the right results. 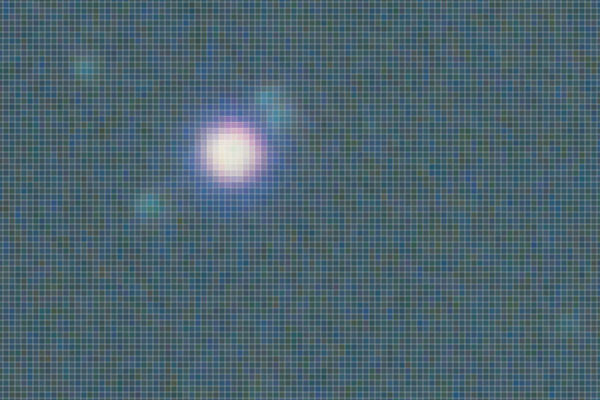 If this were a vitally important image, I might be able to achieve something with Richardson-Lucy deconvolution. I'd have to guess the true nature of the blur and express it graphically, then feed it to the algorithm. In this case, I was able to get acceptable images by simpler means. 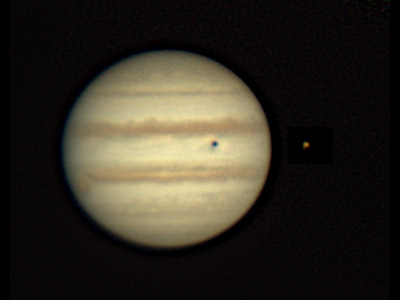 When I photographed Jupiter on the evening of the 11th, I was startled to see a black spot on it. It was, of course, the shadow of a satellite. Here are some infrared and color images as Io passed in front of the planet. 10:17 p.m. EDT. An infrared image. 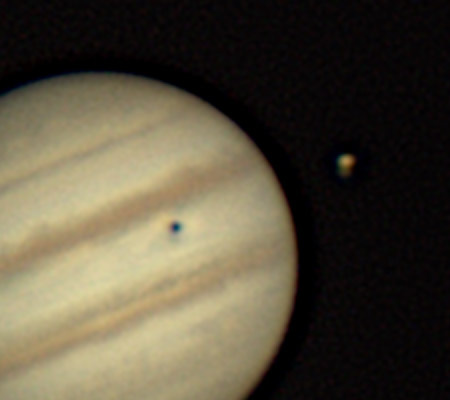 You can see Io, well to the right of its shadow. 10:26 p.m. EDT. 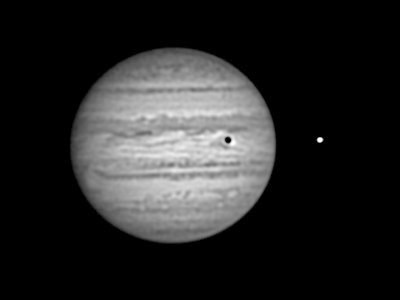 In visible light, Io is not so easy to see; it's almost the same color as Jupiter, so I've added arrows to help you find it. 11:02 p.m. EDT. Io has moved off the face of the planet, but still casts a shadow on it. 11:06 p.m. EDT. The same, in infrared. Recall that Io is the satellite whose surface looks like a pizza: mostly yellow, with some white, red, and black from sulfur that is in different states of melting. It has sulfur volcanoes and must smell awful, if you could smell it. The Internet is home to many strange practices, and I just stumbled upon another one. Google News sent me to this news story. Look carefully at the words I underlined. Clicking on their link sends me to the original story in the Houston Chronicle. Click here to see it. 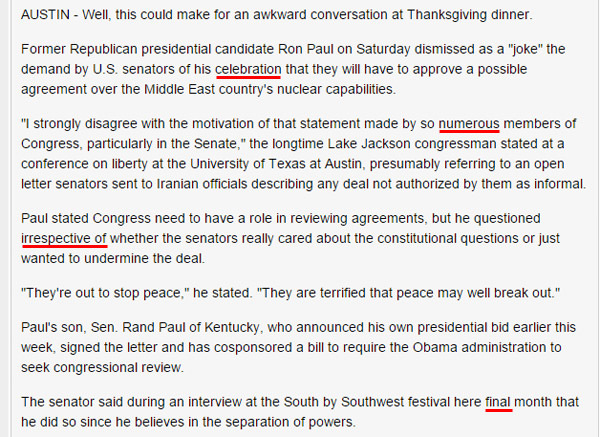 In the Chronicle's version, the underlined words are perfectly normal: "senators of his party" (not "celebration"), "so many members" (not "so numerous members"), "questioned whether" (not "questioned irrespective of whether"), and "last month" (not "final month"). The same is true of strange vocabulary later in the story, in parts I didn't quote. It's not language translation (manual or automatic), because many hard-to-translate sentences, such as the first one, come through perfectly intact. Only occasional words are changed. And they are changed mindlessly, apparently by a computer program that doesn't distinguish a political party from a birthday party. At this point I started thinking about copyright law. If you rewrite something entirely in your own words, you are free of the original copyright because copyright covers expression, not content. However, changing just the occasional word is not enough. You have to understand the content and re-express it your own way. I also started thinking about search engines. Do the word substitutions keep search engines from recognizing the two news stories as the same? Actually, they do not; Google and Bing are good at recognizing imperfect matches. But someone might not understand this. An important clue comes from looking at ThePicayuneLeader.com's web site. It is not (as I first thought) a major Louisiana newspaper. It's a web site that appears to consist of almost nothing but news stories with words substituted in this weird way. The Fox News logo is all over the site even though it has nothing to do with Fox News. It also carries ads of its own, which is apparently how it makes its money. Make of this what you will. For what it's worth, they give a Texas address, but thepicayuneleader.com is registered in Panama, and bulletinstandard.comm (with two m's at the end) is not registered anywhere, nor nameserved by anything my ISP can find. The small amounts of copyrighted material that I have quoted here are "fair use," legal under copyright law because they are quoted only in part, with acknowledgement, for purposes of study and criticism. 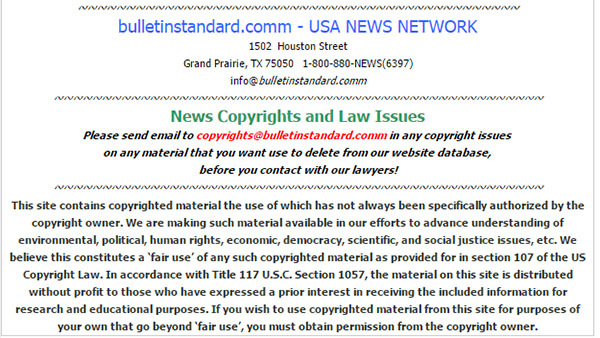 Reprinting entire news stories for the purpose of competing with a newspaper is not "fair use" as I understand it. I want to congratulate my distant cousin Anna Gay Leavitt, fine-art photographer, whose MFA exhibit opened last night. She will soon complete her master's degree at The University of Georgia and become a full-time photographer and photography writer. Maybe even a collaborator with me on some writing projects... Stay tuned, and meanwhile, go look at her work. When UGA changed to the semester system a number of years ago, the spring term started ending around May 1 instead of around June 7. That gave us only one warm-weather month for outdoor events and social activities before everyone disperses — and this is it! Things are a bit frenzied around here. But today is the anniversary of April 11, 1954, which has been identified as the most boring day in history. Nothing important happened then, and no one born on that day is famous (so far). It may be the last quiet day civilization ever had. Finally, if you're looking for something to read, go read about the Cottingley fairy photographs and how gullible people were in the Roaring Twenties. Those "fairies" had Paris hairdos! 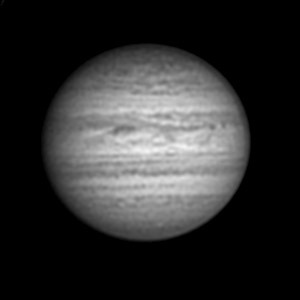 Note how Jupiter shows so much more detail in infrared (670-800 nm). The slight blue tinge that we see in color images of the darker features corresponds to lack of infrared reflectivity. Making up facts is no substitute for finding them out. I keep hearing from "conservatives" who think just like naive Marxists — they start by assuming that economics can be deduced from a few generalizations about human nature, and we don't actually have to look at the real world. A patriotic-sounding quote from someone 250 years ago is supposed to trump any information that has been or could be gathered since. That only works as long as you don't need to get any details right. If you actually want to help the poor, it's not enough to toss out hasty generalizations about how a social safety net makes people lazy (or, for Marxists, about how employers mistreat their employees). You have to find out what is actually going on and what unexpected factors affect it. The real world is full of surprises. Left-wing and right-wing imagination is just that — imagination. I prefer reality. 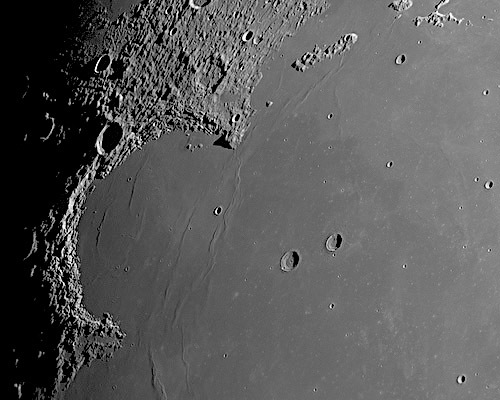 Here are the rest of the moonscapes I took on March 30, using the same equipment and technique as the one I posted on April 1 (at the bottom of this page). These are all infrared images with an 8-inch telescope. 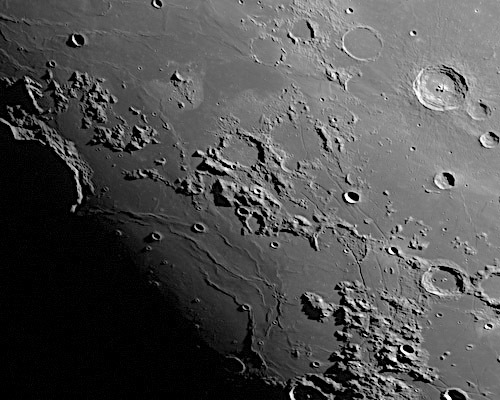 The assiduous reader will note that I was photographing similar things a year ago, with my previous telescope, and may want to compare the images. 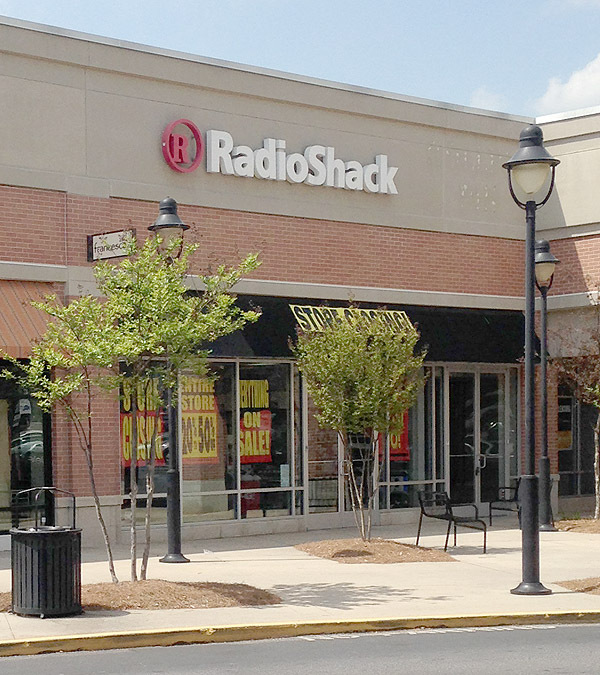 Within a few weeks, for the first time since 1973 I will live in a town without a Radio Shack. Another wave of store closings is taking place, and it apparently extends far beyond the first set of closings announced in February. Both of Athens' remaining Radio Shacks are closing. I'm told that Georgia will be left with just two, one in Duluth and one in Augusta. Press reports are that the new owner of the chain — what little is left of it — plans to specialize in batteries and small accessories, such as headphones. That means they'll be going head-on against Best Buy and Walmart and even truck stops. That is exactly what drove them into bankruptcy in the first place. They gave up their own specialty. With the fast-rising "maker movement," there is a growing niche for electronic hobby shops. Unfortunately, in the 1990s, Radio Shack forgot that that's what it was. It tried to be a cell-phone kiosk and couldn't compete. Its response was to try all the harder. It still couldn't compete because there were already too many cell-phone kiosks, and because sales were doomed to slow down as most people got telephones they were happy with and stopped upgrading so often. 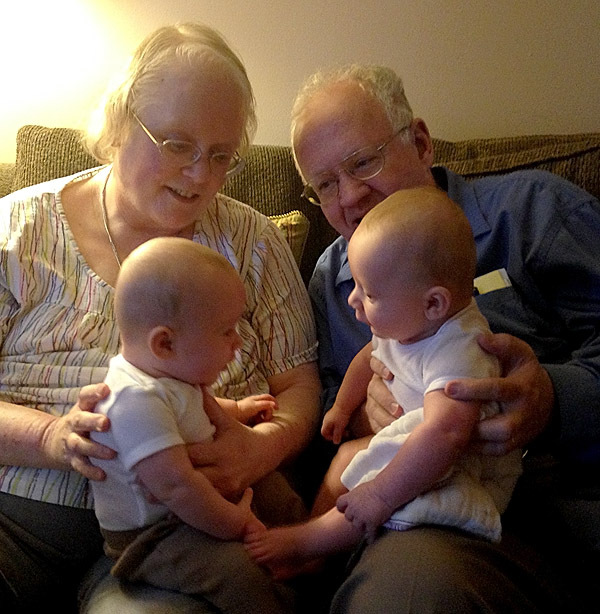 Melody and I have just returned, tired but happy, from meeting our new grandsons in Louisville, Kentucky. Here you see Benjamin and Philip (left and right respectively) having "brother time," looking at each other and imitating each other's moves. They get lonely if they are apart for more than about 20 minutes. Melody's idea of a great vacation was to get to hold grand-babies all day. That's what she did! We were delighted that granddaughter Mary, age 2 1/2, recognized us immediately. We were afraid that, not having seen us for 14 months, she wouldn't remember us. But we had a great time. Here you see Mary acting out a mathematics joke. ("How does a topologist capture a lion? 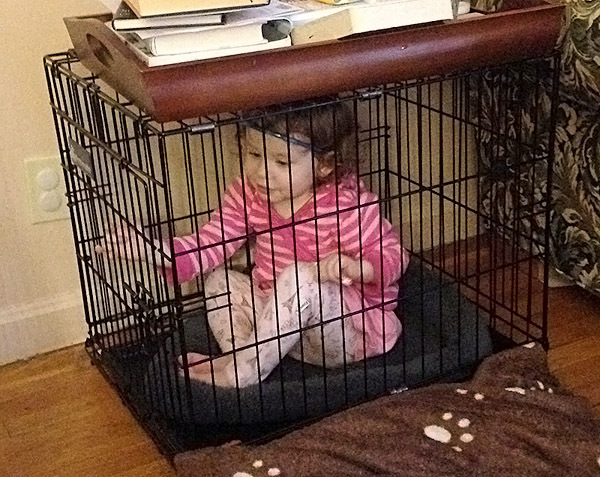 She gets in the cage and then reverses the definitions of inside and outside.") She and I also co-authored a small book of drawings; I'm no artist, but I was able to make recognizable portraits of several of her toys. Daughter Cathy and I repaired two cars. Not only is Cathy one of the top students in the UK Law School (currently on leave to take care of her children), she also delights in going to Pep Boys with Dad and finding another kind of plastic door fastener. Just like me. 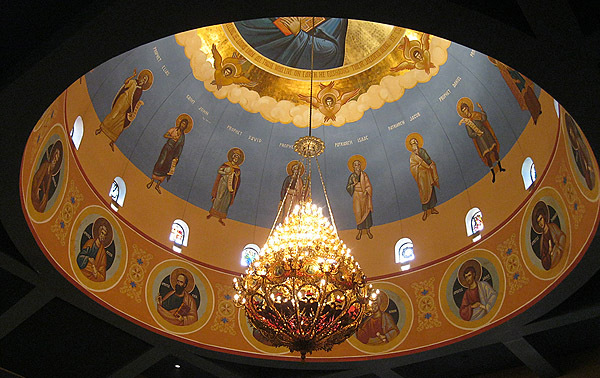 We went with all of these, and son-in-law Nathaniel, to church on Sunday at St. Michael's Orthodox Church, whose beautiful dome you see above, and whose beautiful music you can hear here. The 2.6-hour Palm Sunday service went by quickly because of its intense focus. Yes, Palm Sunday. Because they still use the Julian calendar for some internal purposes, the Orthodox don't have Easter this year until April 12. So we had two Palm Sundays and no Easter this year. To make a bad pun, I told Melody that we will celebrate by dining at Dos Palmas. On Sunday afternoon we crossed the Ohio River so we could add Indiana to the list of states we've been in. Jeffersonville, Indiana, is a charming place in its own way, but we were puzzled why twin cities have not grown up on opposite sides of the river; there's much less on the north side than in Louisville. Then we figured it out. A marker in Jeffersonville pointed out that some time in the 1930s, it had been 15 feet deep in flood water, or something like that. Louisville is where the high ground is. Freeways: On the way up, we took I-75 via Knoxville, and although we had a smooth trip, we saw a huge traffic jam in the other direction, reportedly extending from Cincinnati to Corbin (which is over 150 miles). I-75 has narrow mountain passes with no alternate routes and we were caught in a severe malfunction of it on an earlier trip. For the return journey we chose I-65 via Nashville. Much better! There was heavy traffic and a good bit of what we call "road constriction," but no single point of failure, and no traffic jams, except for a very brief one during the Chattanooga rush hour. The total route may be 30 miles longer (from the east side of Louisville, where we were coming from), but it was worth it. Geo-sleuthing: While zipping through Chattanooga on I-24, we saw a monument that seemed to be out in the woods, next to the highway, and wanted to identify it. Using Google Street View, I retraced part of our path and found it. From the address, I was able to find out that it is Wauhatchie Site 1, a Civil War battle site. You can find anything with Google! "Michael, you take all the fun out of ignorance." — Leo Chappelle, on Facebook, yesterday. I don't have an April Fool prank this year, but you might enjoy the one from two years ago. There's a lot going on, and the Daily Notebook will not be updated again until the middle of next week. Accordingly, I must go ahead and wish everyone a blessed Good Friday and a happy Easter. This is a monochrome infrared image. 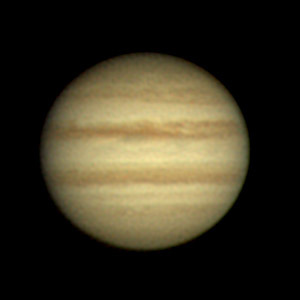 8-inch EdgeHD telescope, DMK camera with IR-pass filter at the f/10 Cassegrain focus, FireCapture, AutoStakkert, RegiStax 6. This is a stack of the best 80% of about 3600 video frames. Copyright 2015 Michael A. Covington. If what you are looking for is not here, please look at previous months.